This is a guest post by Beth Watson of Bechdel Theatre. Beth Watson is an actor based in London. She trained at Goldsmith’s and LSDA, specialises in devised and collaborative theatre, comedy and new writing. She would include political theatre, but all theatre is political. Watson founded Bechdel Theatre in October 2015, after a conversation about gender representation and diversity in theatre at a Devoted and Disgruntled open-space event at Camden People’s Theatre. 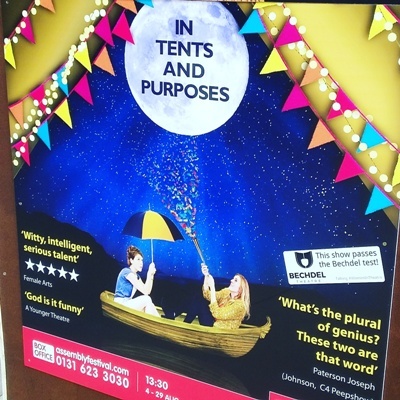 Watson has written guest blogs about Bechdel Testing Theatre for Waking The Feminists, Fringe Review and Bechdel Theatre has been featured in The Stage newspaper. It was a joke, but it struck a chord with feminist audiences who had had enough of women being under-represented or absent on screen. It’s been frequently referenced and debated in feminist pop culture commentary for 30 years, and spawned countless sister-tests and alternatives. As well as movies, it’s been used to talk about representation in TV, novels, video games, and theatre. As a feminist actor and theatre lover, I find the test helpful in looking for scripts to work on and shows to see which are not completely erasing or ignoring the existence of women as humans alongside our functions as mothers, daughters, wives, girlfriends and so on of male characters. This is why I founded Bechdel Theatre: to use the test positively to highlight examples of theatre that buck the trend for underrepresentation, and make some kind of effort to show that people of my gender exist. Since autumn 2015, Bechdel Theatre has been relentlessly applying the Bechdel test to theatre of every genre and on every scale (mainly in London, because that’s where I’m based, but we’ll take recommendations from anywhere!) We’ve been tweeting and blogging about shows that feature women. We’ve stuck ‘pass’ stickers on theatre posters alongside star ratings (inspired by Swedish cinema’s A-Rating) to help audiences seeking shows. We’ve held post-show discussions about shows that ace the test, encouraging a two-way conversation between audiences and creatives about how gender is being represented on stage. We help shows with interesting representations of women to get socially-aware bums on seats by encouraging theatre-savvy professionals and enthusiasts to #BringAFeministFriend to the theatre whenever they have a spare ticket. We want anyone who identifies as a woman (trans* and non-binary, non-conforming women very much included) to record a conversation, by any means possible, whenever you have the time, about any topic important to you (don’t worry too much about mentioning men, if you feel you’re passing the Bechdel test, that counts as a pass!) We especially want to hear from women under-represented in theatre and the wider media: BAME/POC, LGBTQ+, D/deaf, disabled, fat, working-class, over 30 – anyone ignored, marginalised, tokenised, stereotyped or sidelined – we want to get your stories and voices seen and heard. We also want people of any gender/s (or none) who care about representation to be involved: be on the creative team, join the audience, spread the word. The first scratch night of new work generated from your recordings of real-life Bechdel test passes will be at Theatre Delicatessen’s latest beautifully re-purposed space, The Old Library, on Saturday 21 January and live-stream broadcast online for anyone who can’t make it, with subtitled recordings available at a later date (the venue is recently reclaimed and not yet wheelchair accessible, we’ll be doing all we can to increase accessibility for both this event and future shows). The evening will be an opportunity to mingle and have your own conversations with like-minded feminists, as well as seeing the performances. Tickets are available on Theatre Deli’s website. We look forward to hearing your conversations – get recording now and email bechdeltheatre@gmail.com. There are some guidelines on recording your own Bechdel Testing Life conversation on our website. If you’d like to inspire the work at January’s scratch night, the deadline for sending your conversation is 3 January, so you have a couple of weeks to sit down over a cup of something mulled and have a good long chat with a woman in your life. And everyone who contributes a conversation by that deadline will get a free ticket to the scratch night. We can’t wait to hear what you have to say! Image 1 has been created by Bechdel Theatre to promote the project. It shows two cut out faces, in black, with speech bubbles coming out of their mouths which say “Bechdel Testing” and “Life”. There are blue snowflakes behind them. 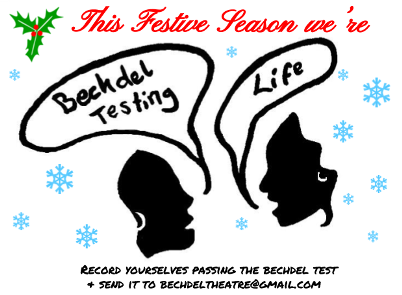 At the top of the image there is a picture of some holly and the words “This festive season we’re” in red and at the bottom of the picture are the words “record yourself passing the Bechdel test + send it to bechdeltheatre@gmail.com”.